"January observation can be almost as simple and peaceful as snow, and almost as continuous as cold. There is time not only to see who has done what, but to speculate why." A warm greetings friends. We hope you all are enjoying the company of family and friends sitting by a fire with hot cocoa (possibly adulterated). Winter is the time for reflecting on the year past and looking to set intentions and goals for the future. It's the season for hibernation, living off the fat reserves and foods that have been cached away. Most importantly, it marks the end of darkness and is the harbinger of new light. 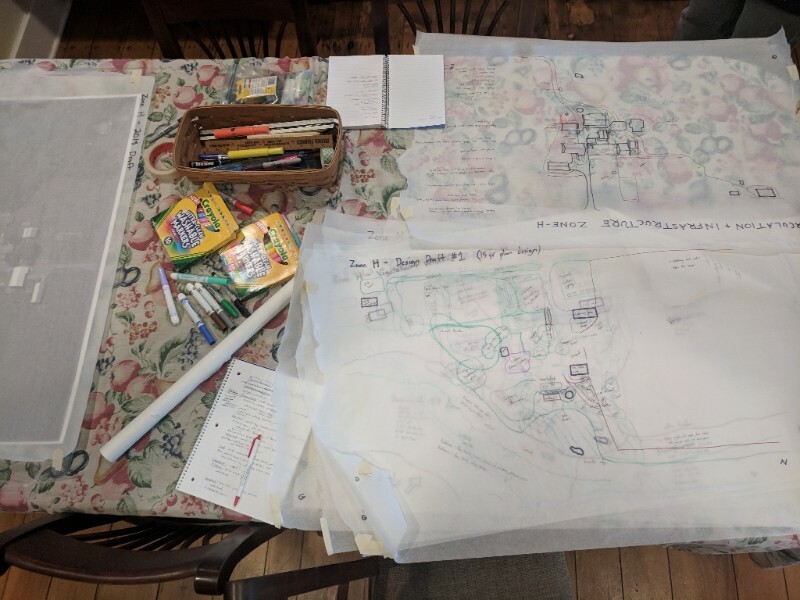 Here at the homestead we've been busy welcoming the seasons rotary by hunkering down and collaborating on a permaculture design plan that looks to regenerate our little corner of the world for generations to come. We'd like to thank everyone who came out and helped us plant over 1,300 trees in our pasture this year. As these trees mature they will provide shade, forage, wind protection for our highland cattle, sheep, hogs, and chickens which will improve their health and well-being. 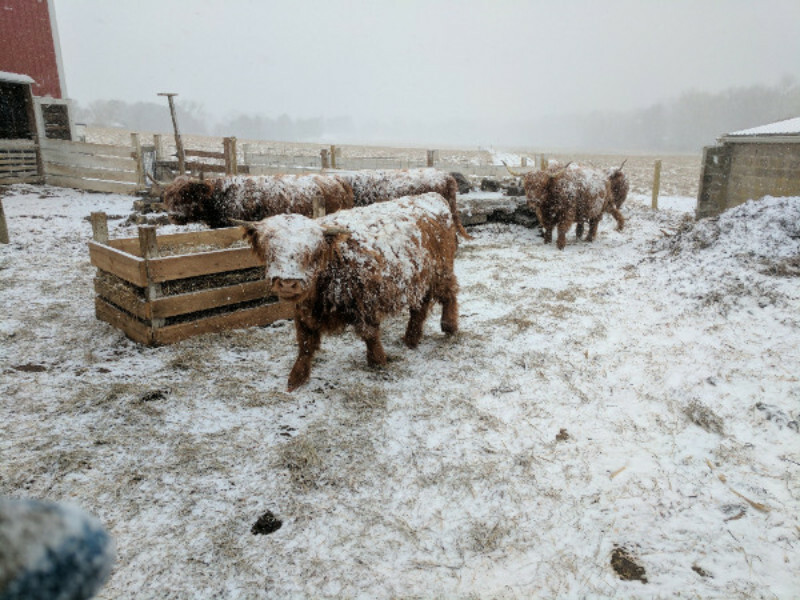 The trees will also benefit the farm by capturing manure and nutrients from the animals, cycling fertility with their deep roots, and soaking up water. All of this will greatly improve the depth and quality of our soil by sequestering boatloads of carbon and will increase the health of the Little Chiques Creek. And down the road, these trees will provide fuel, lumber, fenceposts, and whatever fruit and nuts we can gather before the animals do! Plans for the coming season include planting even more trees(! ), shrubs, herbs, vines and groundcovers to diversify the land and create robust regenerative systems. These plans include a U-pick fruit orchard, a 5 acre hog haven nut pasture, an outdoor kitchen and gathering space, and rehabilitating and rewilding the existing riparian woodlot that hugs the creek. Keep your eyes and ears open for upcoming farm events/skillshares to help make these projects happen and learn a thing or two while doing it! "Observe and interact" is the first principle in permaculture design. Winter is also the most conducive time for observation. We're forced to slow down our hurried lives, even stop on days that Mother Nature tells us to. In this time of stillness it's easier to observe both what is around us and inside of us. Take it all in with all of your senses. Look at things from different perspectives. Sit with it. Take detailed notes as you recall what you've observed. Ask questions of your perceptions, your interpretations. Then, maybe, it's time to interact instead of reacting. We have a website now! You can send us orders for pork and lamb as well as see current inventory and prices! We also now have an order pickup on Mondays 5-7pm at 140 Mulberry St in Lancaster. Send us your order and let us know you will be there! Thanks! - Learning Tours around the globe to work with partner organizations. These organizations focus on women’s and girls issues, climate change and environmental issues, and social justice. - Sustainable Living Centers that “put our principles into practice” in Harrisonburg, Va and Starksboro, VT.
- Providing speakers and educational materials for schools, campuses, faith communites regarding all aspects of their work. We have joined with them as an affiliate - which means we share the basic values and goals of NCP, and we will work together to share knowledge, support and encouragement. So we will help share information about their programs and offerings and they will do the same for us. Expect to see more about this in the future! There are a number of organizations across the US that are advancing the causes of food justice, ecological restoration, and regenerative agriculture. Often these are groups led by people of color that do not receive the news, credit, or funding they deserve. As a community committed to furthering regenerative agriculture, permaculture, and right livelihood for people, we want to highlight and share some of these community-focused food and justice organizations with all of you. The Black Permaculture Network and the National Black Food and Justice Alliance are two such groups. I encourage you to look at some of the work they are doing, support their causes, and offer any resources you can make available. Reading the Black Permaculture Network Solidarity Statement is a great place to start! Designing where to plant trees and orchards means maps, crayons and creativity! Once every month we come together to discuss a different article as a group. Topics so far have covered social justice, climate change, the importance of language and names, and radical economics. February's article will be The New Jim Crow by Michelle Alexander discussing racism, mass incarceration, and the war on drugs. Our friend Emily Wilcox and community member Donna Volles will be showing the ways of this ancient Chinese fermentation. Kombucha (aka "mushroom tea") is a vinegary sweet health beverage brewed with a mother SCOBY. There will be tastings of different homemade kombuchas and juns, a brewing demonstration, discussion, and the opportunity to take home your own SCOBY! Free by donation ($10 suggested) no one turned away! 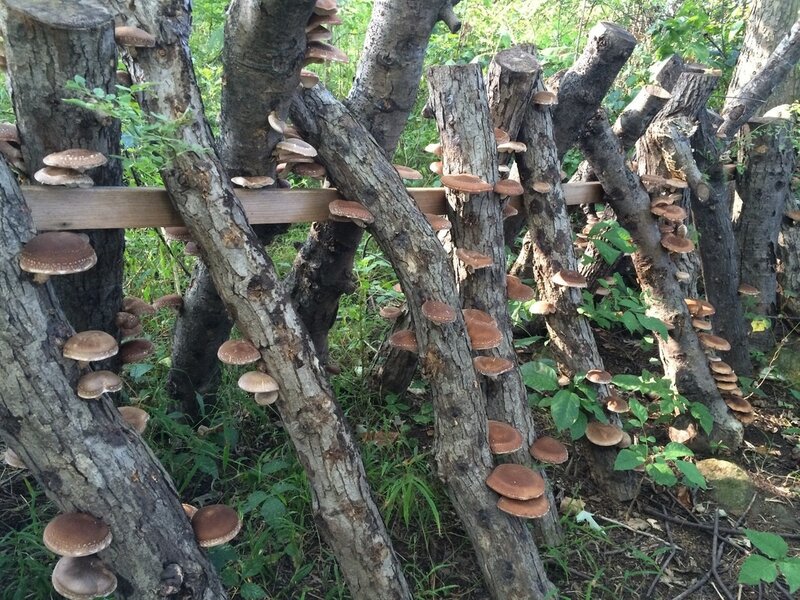 Come join us to learn how to inoculate and grow your own shiitake mushrooms outside on logs. Participants will have a log to take home! Details to come! Have an idea for a skillshare or event? Something you want to learn, something you want to teach, or something you feel like is missing in our corner of Lancaster? Email us your thoughts and ideas! Love the site! Photos are amazing. I learned alot and now understand so much more.